The key to brew a fine cup of Siphon Coffee is the heat since the halogen light siphon bar will enables rapid heating. 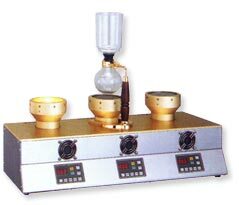 With previous models using conventional gas heating it was very hard to control the temperature and the fluctuation of the heat would effect the taste of the brewed coffee. But the halogen light siphon bar will heat up the flasks efficiently and each cup you brew will be consistent. Set the water in the top of glass globe. Set the dark roasted coffee in the glass tubes and moist the coffee and cover the surface of coffee by filter. Set the dripping speed. 2 drips per 3 seconds is ideal. After all the water on the top is gone, the extraction is complete. Remove the carafe and store in a cool area. Coffee brewed by water drip has rich aroma with a crystal clear taste. We carry these and more products from Lucky i Cremas. Our products have been featured in The New York Times and National Post.